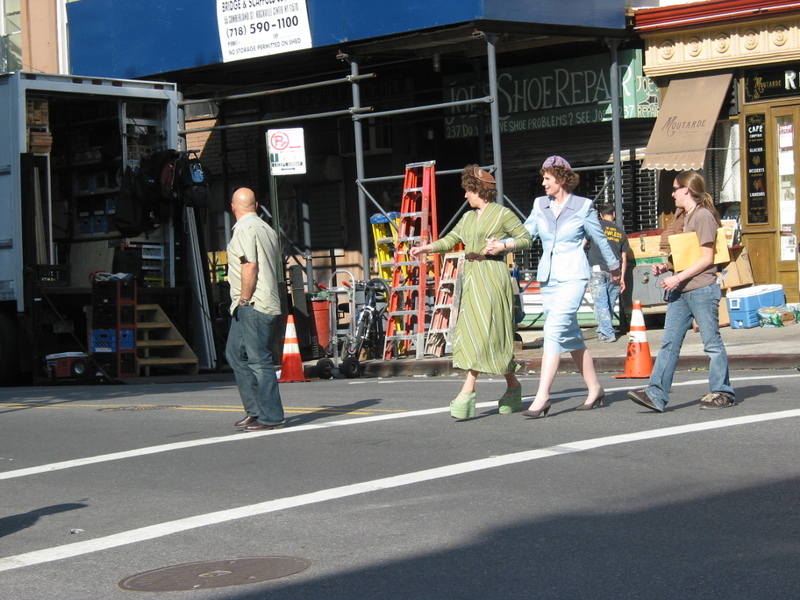 I couldn't resist hanging out on Carroll Street in front of my house yesterday to take in the shooting of the film Julie Julia at Cafe Moutarde next door. Starring Meryl Streep and James Tucci, Streep was shooting a scene with Jane Lynch, suitably decked out in 50's garb and painfully high heels. Of course, expecting any excitement at a film shoot is about what you get watching paint dry. After checking out the mountains of equipment and trying to watch the video monitors for any sign of activity for what seemed an hour, I gave up and went in. Then came out again, of course...had to have coffee from Tempo next door. Several of us Carroll Streeters who work at home (or don't work) were lounging outside the restaurant Al-Di-La and talking loudly in a Brooklyn-esqe way. Since we had identified Streep's trailer, we pointed it out, helpfully, to curious passers-by. Finally Streep's burly bodyguard stared balefully at us, and one of my neighbors shouted out "Don't worry, we're not stalking her!" As if that would be calculated to soothe him. But he merely continued to keep a watchful eye on us and did not come over. What was surprising to me was that with all the stuff all over, cables everywhere, equipment on the sidewalk and antique cars parked in choice spots (they did not actually seem to be used,) we could walk as we pleased, more or less...occasionally the handlers would motion us, politely, to move back or away. Even regular vehicular traffic was not stopped except in brief spurts. I was quite impressed at the lack of formality, thinking that this was a good example of "negotiation" between different users of the road space, which happens the world over but is frowned upon in the US. As one of the observers said "I can't believe they let people and cars go by, it's an accident waiting to happen." Spoken in true American fashion. Offer to provide daily progress reports or updates, instead of receiving so much hands-on supervision, so the boss knows what’s going on.